Are you having champagne this New Year's Eve? Why not reserve a small amount for your salad? 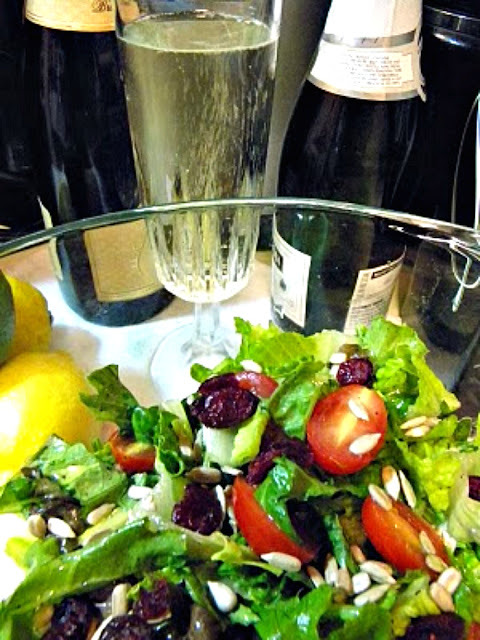 Most champagne vinaigrette recipes use champagne vinegar. 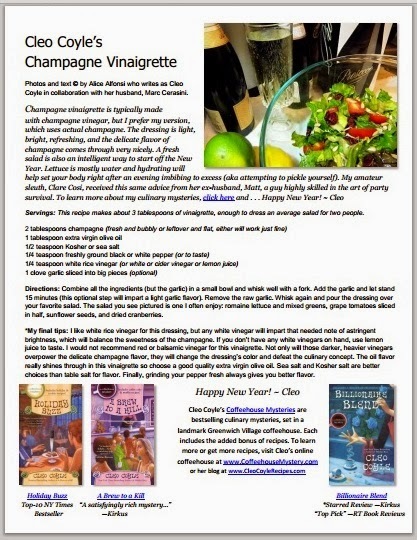 My recipe uses actual champagne! The recipe will work with either fresh or leftover bubbly. Whether it's fizzy or flat makes no difference, it's delicious. When the countdown is done, the ball has dropped, and the last of the champagne has gone flat, waste not. You know the stuff I’m talking about, those dregs in that bottle sitting in your fridge. Don’t pour that sad, fizzless liquid down the drain. Do what I do every New Year’s week. Use it to make champagne vinaigrette. Yes, I know, champagne vinaigrette is typically made with champagne vinegar, but I prefer my version for frugality and fun. My vinaigrette is light, bright, refreshing, and the delicate flavor of champagne comes through very nicely. A fresh salad is also an especially intelligent way to start off the New Year. Why? Lettuce is mostly water and hydrating will help set your body right after an evening imbibing to excess (aka attempting to pickle yourself). “Drink lots of water. Hydrate with salad. Even better, dress those crisp, healthy, greens with a hair of the cat that bit you!" 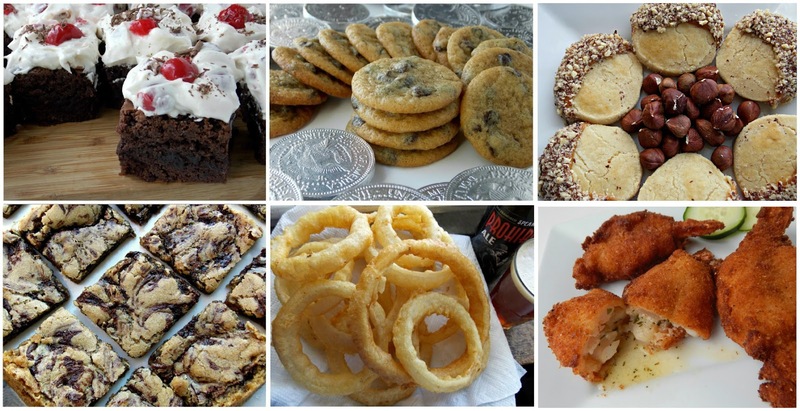 My recipe and photos in this post were part of a past Foodbuzz Top 9 Pick among thousands of food bloggers around the world. Servings: This recipe makes about 3 tablespoons of vinaigrette, enough to dress an average salad for two. Directions: Combine all ingredients (but the garlic) in a small bowl and whisk well with a fork. Add the garlic and let stand 15 minutes (this optional step will impart a light garlic flavor). Remove all of the raw garlic. Whisk again and pour the dressing over your favorite salad. The salad you see in my photos is one I often enjoy: romaine lettuce and mixed greens, grape tomatoes sliced in half, sunflower seeds, and dried cranberries. * The oil flavor really shines through in this vinaigrette so choose a good quality extra virgin olive oil. * Salt: sea salt and Kosher salt are much better choices than table salt for flavor. * Pepper: I often use black pepper or a pepper mix for this dressing, but if you want a really nice presentation, use white pepper. Grinding it fresh always gives you better flavor. Recipe Guide by clicking here!